Remove added stress on your ears. 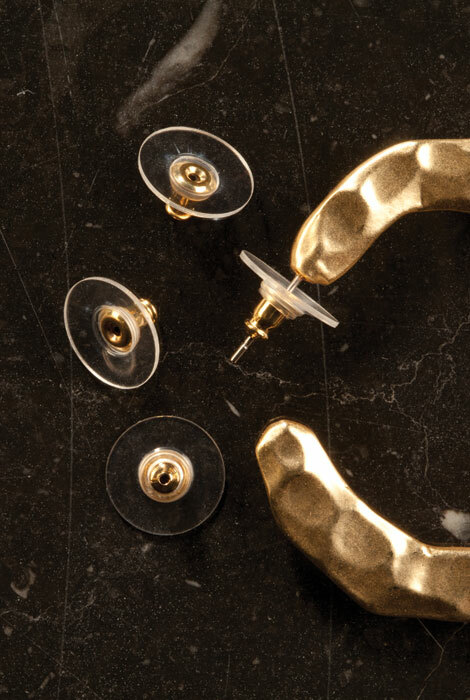 Replace regular backs to give support and stabilize large earrings, helping keep them upright. Clear plastic discs have metal centers. Set of 24 includes 12 gold and 12 silver. 1/2" each. Effectively holds earrings up against your ear without pinching. No more drooping earrings or pinched ears! These earring backs are truly comfortable, and hold larger earrings up. I use them for all earring sizes because they are so light, I can't feel them. I always seem drop one and it's always good to have some spares. Keeps earrings flat against the ear and cushions the back of the ear. This is a great product for keeping your earrings in place. The earring clutch has a snug fit, but is comfortable to wear. Best of all, my earrings now remain straight. You will not have any more sagging earrings with these backs. Made from durable clear plastic with gold or silver tone centers, these backs will coordinate with your jewelry plus add comfort and support to the heaviest earrings! They are a must for anyone who wears pierced ears' earrings! I have a lot of earrings that are costume jewelery. I have never been able to wear these earrings for too long because the butterfly backs make my ears hurt. Now that I have these backs I'll be able to use my costume earrings without worrying about the back of my ears hurting. I bought two sets of these. One for me and the other one for my very best girlfriend. Her ears are sensitive too.... Great product! HAVE ALWAYS LOVE THESE BACKINGS FOR EARRINGS BUT HAVE HAD A HARD TIME FINDING THEM. A lot of post earrings come with just a small backing. I replace all these with these plastic discs that hold the earring more firmly, especially if one has earlobes that are free from connecting to one's face. will work great - stabalizes the earring! So easy for senior fingers to grasp. Comfortable to wear. These are always getting lost. I am constantly scramblilng to find another one for my earings. It is nice to have these on hand for replacements. Great for the price. Great for stabilizing heavy post earrings. Nice to have them in silver and gold, although it doesn't really matter as they're on the back of your ears and noone should be able to see them. I have always used these for my heavier earrings and hook earrings I didn't want to lose !! Bought these to use on some of my bigger earrings. I have also used them on smaller earrings instead of the butterfly backs that can be hard to fasten or to pick up with arthritic hands. I love these as earring backs as mine eventually stretch so these are great replacements. Have been looking for them for a long time. So glad I found them in your book! Most earrings come with those awful butterfly backs. These are much more comfortable so that the earrings can be worn without having to readjust or causing any pain. 1) Keep wire earrings from falling out. 2) Help certain pierced earrings fit better. Pricing is good,but posts do not fit in clutches without severely bending them...cannot use,and not worth the cost of returning them! I always get earrings where only one back functions properly - what a great price, to have extra on standby! My ears are pierced a bit low so these should help support my heavier earrings. Always losing the backs off my post earrings. These help larger earrings remain "upright" and not droop - love them. Earring backs do get lost so these are replacements. They aregenerally the most secure way for me to wear pierced earrings and I lose them on occasion. I'M ALWAYS LOSING THE BACKS OF MY PIERCED EARRINGS. I always need a supply of these, as they break and get lost easily. I just bought large earrings that need the extra support. Over time I find I end up loosing the backs to my earrings. It's hard to find these larger earring backs, so I buy them when i see them. Love this type of earring clutch for security of earring. I have lost all of my backs and these seem like a good replacement.